The smallest room in the house is the perfect place to make a style statement that might be overwhelming in the living room. 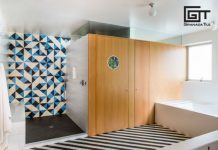 While you might feel more comfortable cloaking the rest of your home in neutrals, here you can go bold and, color and pattern-wise at least, big. Whether you want to make this room into a jewel box by taking our cement tiles from floor to ceiling, as in the example above, keep the focus on one wall or cover the entire floor in concrete tiles, Granada cement tiles are the perfect canvas. Choose from our in-stock tiles, check out our webstore, or tap your inner artist by creating your own using our custom design tool. 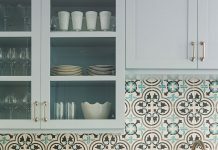 And as an added bonus, encaustic tiles are low maintenance (so they’ll look beautiful for years to come), long lasting, and environmentally friendly.